Discussions ouverte avec les invités. vier Aktions- und Workshoptagen der CISPM im Februar 2015. Danach laden wir alle, die teilnehmen dazu ein, mit uns zu diskutieren und Informationen und Kritik zu teilen. Kommt zu unserer Informationsveranstaltung und feiert, tanzt und singt danach mit uns. Es wird den ganzen abend Cocktails geben. – STOPPT DEN KRIEG GEGEN MIGRANT*INNEN! 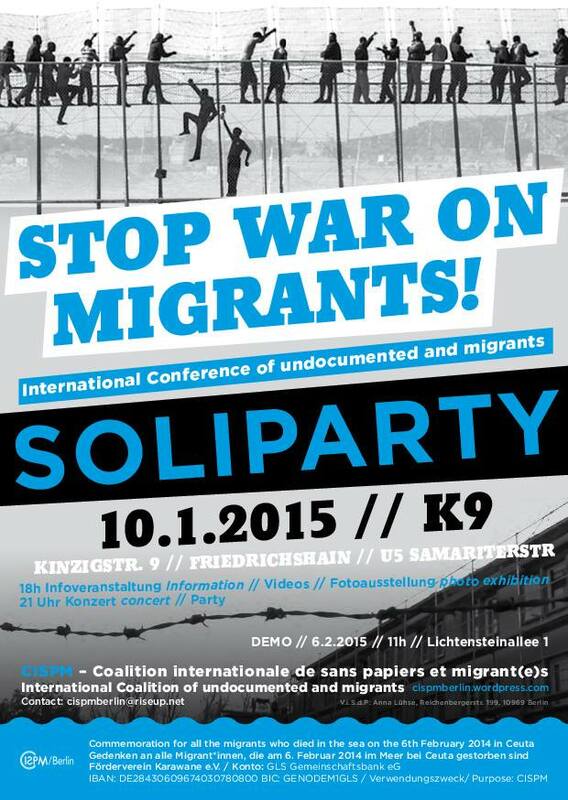 SOLIPARTY in K9 (Berlin) to support our four days of action and Workshops from 5th to 8th of February 2015 in Berlin on the Theme : Anniversary of the massacre of the 6th February 2014 in Ceuta – STOP EU WAR AGAINST MIGRANTS! Pendant ces 4 jours, des ateliers seront organisés traitant des différents aspects de la guerre contre la migration de l’Union Européenne aux frontières extérieures ainsi que dans sa politique intérieure. C’est une étape décisive pour la création d’une Plate-forme d’action transnationale des migrants, des réfugiés et Initiatives solidaires dans le cadre de la CISPM – Coalition Internationale des Sans-Papiers, Migrants, Réfugiés et Demandeurs d’asile. We are organizing four days of Action and Workshops in Berlin February 2015, including a memorial DEMONSTRATION to mark the one year anniversary of the massacre on 6th February 2014 in Ceuta. STOP THE WAR ON MIGRANTS! During the Action Days there will be workshops on different aspects of the war on migration: on the external EU borders, and also internally. This is one step on the way towards the creation of a transnational action platform for migrants, refugees and solidarity initiatives, with the CISPM (International Coalition of Sans-Papiers, Migrants, Refugees and Asylum Seekers). Delegations from 8 different European countries (Belgium, France, Greece, Italy, Netherlands, Poland, Switzerland, Spain) and Tunisia will take part in the workshops. Financial contributions will be used for travel expenses, catering and mobilization printing costs. We expect more than 300 migrants from EU countries, from within the CISPM and from all invited active refugee networks in Germany. Every contribution is welcome. CISPM Berlin: Voix des Migrants, Droit des Migrants, Caravan for the Rights of Refugees and Migrants. With the support of Afrique-Europe-Interact, Borderline Europe, Joliba, KuB (Kontakt und Beratungsstelle für Flüchtlinge und Migrant_innen e.V. ), Welcome 2 Europe. Bank account: Förderverein Karawane e.V. GLS Gemeinschaftsbank eG – Specify purpose: CISPM – Tax-deductible donation. Appel a tous/tes les affecté(e)s de la Guerre que l’Union Européenne mène contre les Migrant(e)set Refugié(es) aux Frontières extérieures comme à l’intérieur de son ordre politique et social. Stop au durcissement du droit d’asile! Stoppt die drohende Verschärfung des Asylrechts! Stop the impending limitation of the right to asylum! Against police violences, pushbacks and violation of human rights that are endured by migrants in Melilla.